20 To 01 sparks search surge! Million dollar TV extravaganza begins! The Seven Network‘s million-dollar historical epic Against The Wind premieres this week. The 13-part series, starring Mary Larkin and Jon English, took six months to make and is the culmination of intense research and meticulous set construction and costume design to properly reconstruct 19th century Australia. Also starring in the mini-series is Frank Thring, Gerard Kennedy, Frank Gallacher, Lynn Rainbow, Fred Parslow and Hu Pryce. Executive Producer is Ian Jones. Former The Young Doctors and Class Of ’75 actress Peita Toppano has scored the role of housewife-turned-murderer Karen Travers in the upcoming Grundy Organisation series Prisoner, being made for the 0-10 Network. Production of the thirteen one-hour episodes is to start in Melbourne in October and the series also stars Elspeth Ballantyne (Bellbird), Val Lehman, Carol Burns, Colette Mann and Richard Moir. Stuart Wagstaff has revealed that he has never had a written contract for his cigarette commercial work. Everything, including pay rises, was done by gentleman’s agreement. Latest catch-phrase in the United Kingdom is “I’ll rip yer bloody arms off!” following the screening of the pilot of The Little Big Show, starring Grahame Bond. 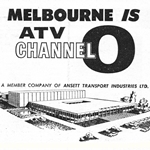 The atmosphere at Melbourne’s ATV0 studios has never been so highly charged since the halcyon days of The Box, with all studios working to capacity. 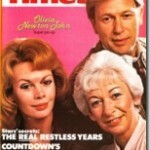 “I’ve been watching The Restless Years from the beginning and haven’t missed out once. But since Deborah Coulls isn’t in it any more, I dislike it a bit. There have probably been reasons for taking Deborah out of it, but I reckon Sue Smithers (pictured) can’t act as well as Deborah.” A. Wiesenthal, NSW. “I cannot understand why ABC sent Norman May to Canada to commentate at the Commonwealth Games after his awful exhibition at the last Olympic Games, especially the swimming events.” W. Dickie, NSW. “Would somebody mind telling that bore, Ian Meldrum, to grow up! Why ABC insists on inflicting him on the ever-suffering viewing public is beyond me.” A. Rankins, NSW. ABC‘s long-running current affairs program Monday Conference features an interview with the Prime Minister Malcolm Fraser. As mentioned above, Against The Wind debuts Tuesday night on HSV7 in a two-hour episode. 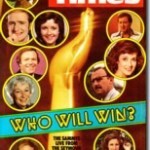 Earlier the same night, ABC screens the first of a six-part series Run From The Morning, a mystery thriller starring Michael Aitkens (The Truckies), Bud Tingwell, Rod Mullinar and Bill Kerr. It’s a big week for premieres for ATV0 this week. On Monday night at 7.00pm, The Daryl And Ossie Show debuts as a half-hour variety/game-show format with Daryl Somers and Ossie Ostrich having made the move from hosting GTV9‘s Hey Hey It’s Saturday last year. 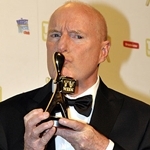 Stuart Wagstaff hosts the debut of the ATV0‘s new talent quest series, Showcase, reviving the former 1960s format of the same name. Leading the 36-piece orchestra is producer Hector Crawford, and judging the acts are Robert Helpmann, Margaret Schofield, Roger Savage and Kenn Brodziak. On Thursday night, ATV0 presents the first episode of comedy series The Tea Ladies, starring Pat McDonald and Sue Jones (pictured) as tea ladies working in Parliament House, Canberra. Sunday night movies are There’s A Girl In My Soup (HSV7), Holiday On The Buses (GTV9) and The Man Who Would Be King (ATV0), while on ABC‘s Capriccio!, actor Warren Mitchell has chosen the music to be performed on the program.